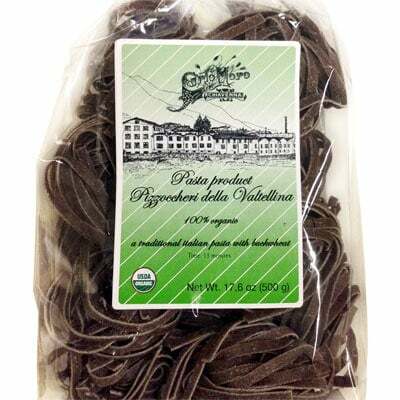 These bundles of Pizzoccheri Buckwheat Pasta is from pasta artisans of Carlo Moro. It is a type of specialty pasta from the town of Siena, in the Lombardy region. Its main ingredient is buckwheat and it has quite a rustic earthy flavor to it. Compared to other pasta types, this one is high in fiber and can be quite a delicious comfort food. This is especially true during winter. And contrary to its name, this pasta doesn’t actually have any connection to pizzas. One of the most popular ways to serve it is with fontina and Parmesan cheese. Or if you want, you can also check out Nonna Carla’s recipe from our Lombardy Nonna Box. Do you find this pasta uniquely interesting? Then go and grab this pack of bundles today!